Picked 5 Different Types Of Berries Out In The Garden Today! I hope we are able to go pick some U-pick berries soon, to put in the freezer and make some freezer jam–I really need to clean out my bigger freezer and organize it better–berry motivation! Let me say, this might seem like a lot to think about. But keep in mind, some of the questions may not apply to your particular plant issue, so just answer the ones that apply to your plant. This list of questions does give you a systematic way to examine a plant, in order to discover clues that lead to an identification of a plant problem, so it might give you a starting place to begin looking and thinking about the plant problem. 17. Where is the plant situated? Shallow soil 6 inches or less depth? Insecticide: Type, dated applied and where applied? Fungicide: Type, date applied and where applied? Fertilizer: Type, date applied and where applied? 20. Have any of these weed killers been used in your landscape/garden within the last two years? Round-up, Kleen-up, Knock Out: where and when applied? Triox, Noxall, Spike, other soil residual: when are where? Others: Name of product, where and when applied? 21. Was a separate sprayer used when applying weed-killers and insecticides/fungicides? Yes or No? Construction or heavy equipment over soil? Change of soil grade–landscaping or poor installation? Soil/root injury–septic work, trenching, root removal or cutting, pool installation, construction? Addition to soil of a volume of organic matter or other soil additives? Trunk or bark injury: injury to the plant from a lawn mower or weed eater, staking wire, rope or twine? Extreme drought: no irrigation for several months in spring, summer or fall months? Driveway or road paving nearby? 23. What do you think the problem is? Whew–that’s it! This should give you some specific information that will help lead to an answer in identifying your plant problem. Here are some resources that you can access online and in person to figure out how to fix plant problems once they are identified. Some also help you with plant problem identification as well. Washington State University puts out two excellent websites that are helpful for identifying issues related to specific types of plants. They are: Hortsense and Pestsense. They make a very helpful first stop when you are trying to figure out what a plant problem is. Educational, with several pictures useful in identification of plant issues. The only drawback is that they don’t list much in the way of solving the problem. However, their focus is that of IPM, or integrated pest management, which uses the least harmful and least toxic methods of solving a problem first before moving on up the ladder of toxicity, making it much safer for homeowners, their children, as well as pets and wildlife. My favorite plant pest and disease book: American Horticultural Society Pests and Diseases: The Complete Guide to Preventing, Identifying and Treating Plant Problems. By Pippa Greenwood, Andrew Halstead, A.R. Chase and Daniel Gilrein. This is the one I have turned to for help when working in the Master Gardener Answer Clinic office. And as the title says, it is very complete, mentioning nearly every type of plant that you would find in a garden. Many libraries have this book, but it’s a good one for your personal reference library as well. 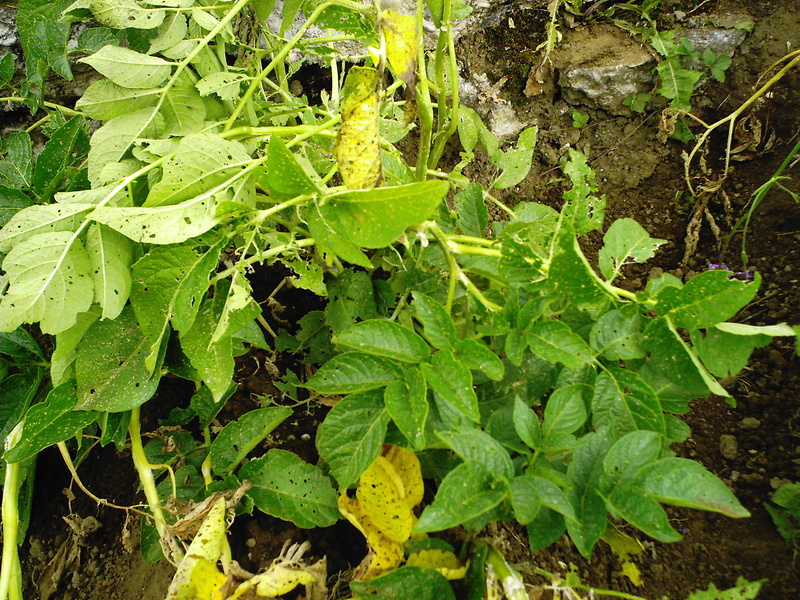 July 28, 2010 Update: I found another excellent resource concerning plant diseases, and it is the Cornell University’s Plant Pathology Department. They offer Vegetable MD Online, which focuses on plant diseases by crop, and comes with pictures. 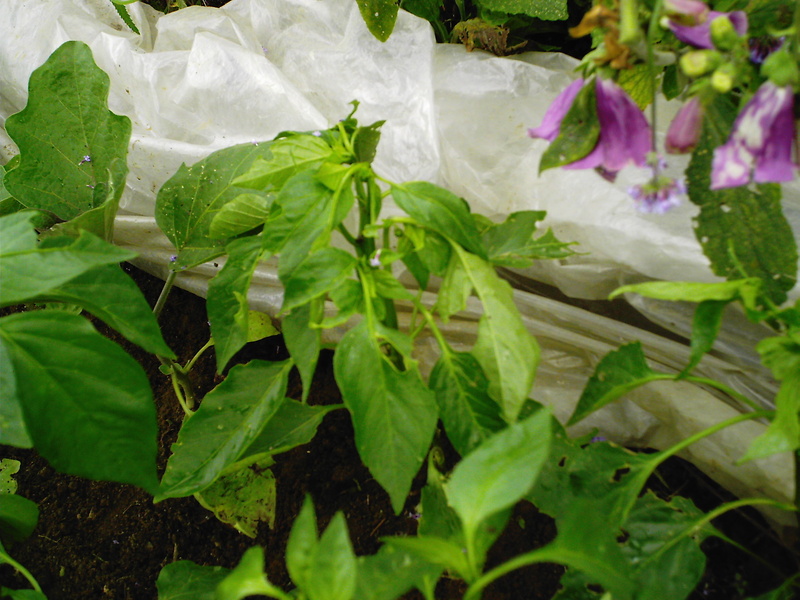 A tremendously helpful website, it also gives some solutions for each of the plant problems, and lists disease-resistant varieties. As Mulder would tell Scully on The X-Files, “The truth is out there.” And there are answers to plant problems–it sometimes just takes a while to figure it out. The longer you garden, the easier the identification process will become. Just start, and always feel free to contact your local cooperative extension office, where the extension agent or Master Gardeners will do their best to help you when you get stumped. Here is the next installment in the plant problem troubleshooting series. I highly recommend that you check out Parts One and Two before digging in to Part Three–There are questions that were asked previously that get built upon in this segment, and the whole thing will make much more sense. 9. When did you first notice the problem (approximate date)? Did the problem happen very quickly? Is it not getting worse? 10. Has the plant ever had this problem before? If yes, when? 11. 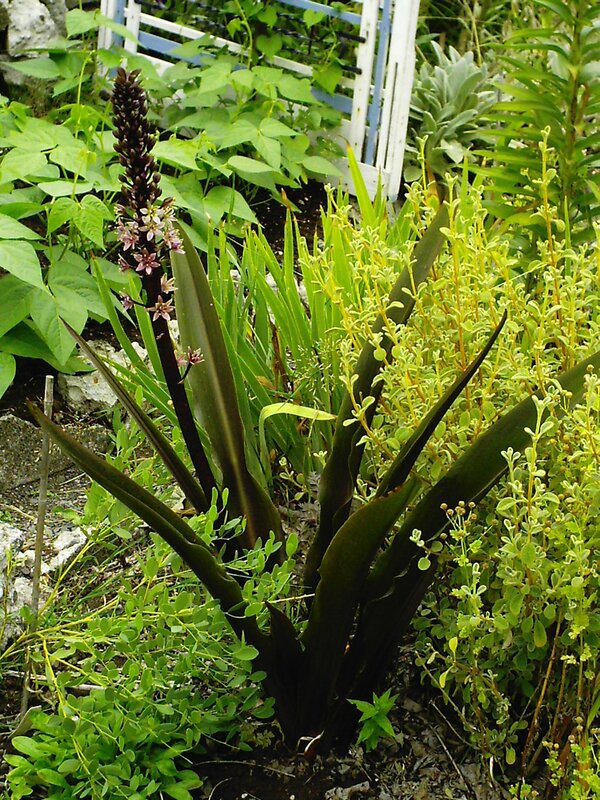 Are other plants in your landscape or garden similarly affected? If yes, which ones and where are they located? Flowers: Are there spots, are they wilted, distorted, is there insect injury, or some other issue? Fruit: Are there blotches, it is dry or distored, is it rotten or mushy, or some other issue? Leaves/needles: Are there spots, are they wilted or rolled, do the leaves fall off, are they distorted, are they yellowish or brown, or some other issue? Roots: Are they brown (internally), are they rotted, are they chewed, are there few roots, or some other issue? Twigs: Are they dead, are there decayed areas, are they sticky/weepy, or some other issue? Stems: Are they dead, are there decayed areas, are they sticky/weepy, or some other issue? Large branches: Are they dead, are there decayed areas, are they sticky/weepy, or another issue? Trunk: Is it dead or losing bark, is there a decayed area, is it stucky/weepy or some other issue? The whole plant: Is it wilted, distorted, stunted, or some other issue? 13. Have the base and/or roots of the plant been checked for signs of a problem or injury to the plant? If so, what did you find? 14. How was the plant planted? pot/burlap removed from the root ball? 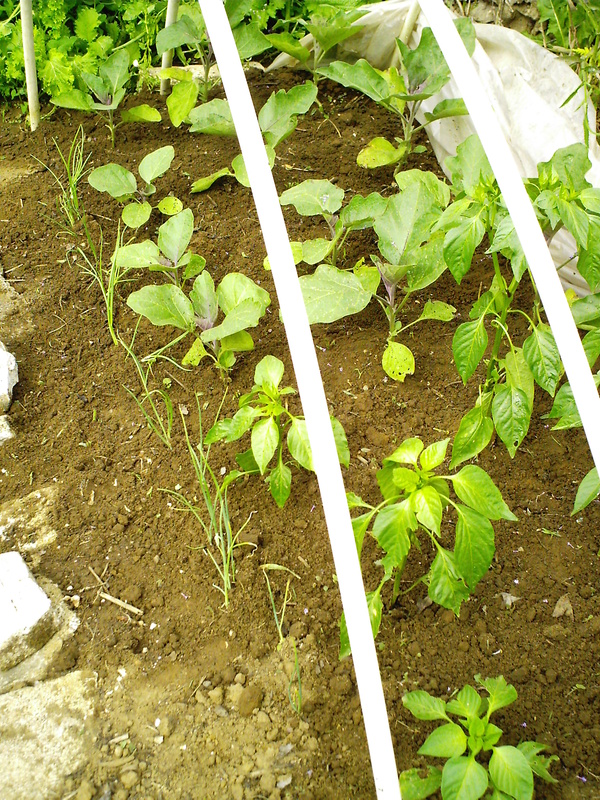 fertilizer applied at planting or right after planting? 16. How is the plant watered? Where is the water applied? watered whenever you water your lawn? watered directly at base of plant? How often is plant watered? how many times a week, and for how many minutes? as needed with checking soil? as needed without checking soil but relative to weather conditions? Hope you are enjoying the series so far! The final installment will be up soon. These curb strip areas, narrow bands of soil surrounded by sidewalk on one side and the asphalt road on the other, tend to be very dry and some would argue not the best place to try to garden. However, I have had good luck with growing a variety of plants that thrive in what are ordinarily some fairly harsh conditions. I do not water these plants myself; Mother Nature provides any water they get in the form of rainfall. Some of these plants I didn’t even plant out there myself, because they reseeded on their own from other areas of the garden. But these have grown and come back each year with not much help from me. Admittedly, some of these plants are rather tall, and they may not work for you if you are trying to get in or out of a vehicle right onto the sidewalk, but we tend to park closer to our garage area where it is open and easy to disembark from a car, so it’s not an issue for us. We followed Maurice Horn of Joy Creek Nursery’s advice to dig up the soil in the strip and add plenty of gravel to provide good drainage for the clay soil that is there–that’s basically all we did to “amend” the soil. No fertilizer added. 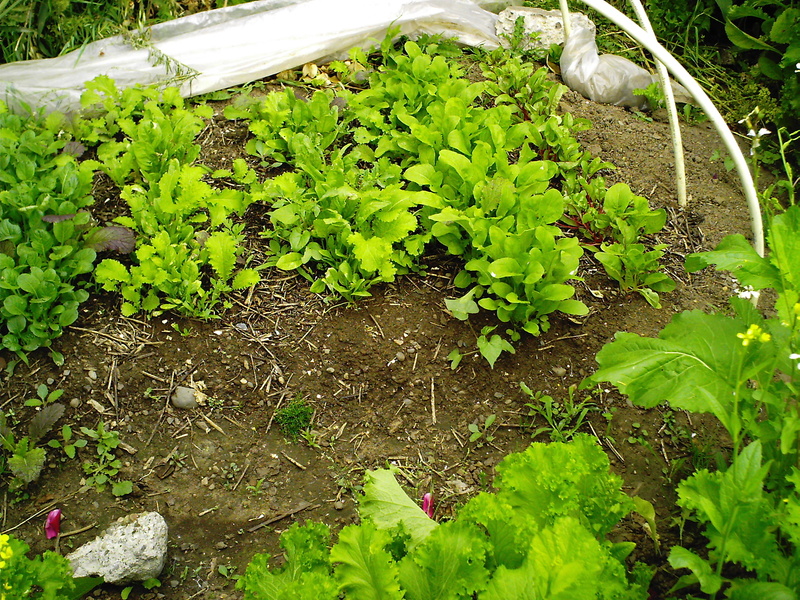 I occasionally will add some compost in the fall, and usually it gets a mulch of leaves in the fall and winter from nearby trees that drop leaves. Several plants in this small area. Moving from left to right, there is a bright red crocosmia ‘Lucifer,” followed by Lamb’s Ears pink and grey flower stalks below. 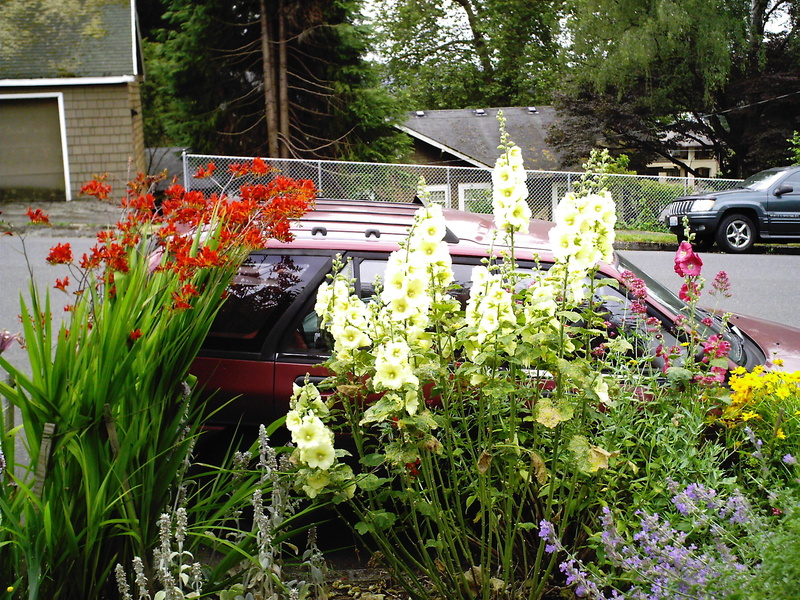 Next are yellow hollyhocks, and a little grouping of pink hollyhocks mixed in with some Centranthus rubrum, or commonly known as Jupiter’s Beard. The yellow at the end is a bit of coreopsis, probably ‘Sunburst’ because I have it growing elsewhere in the garden and it reseeded down here. Across the sidewalk from the curb strip are two terraces with four-foot tall retaining walls that are planted with other drought tolerant plants, one of which is the blue catmint that you see in the bottom right foreground. The crocosmia, hollyhocks, Jupiter’s Beard, Lamb’s Ears flowers and catmint are all hummingbird nectar plants as well, because the flowers are all essentially large to small tubular shapes. A close-up of crocosmia ‘Lucifer’–such a pretty flower, hummingbirds love it and it also makes a great cut flower for flower arrangements. To the immediate left are some just finished blooming Oriental lilies, ‘Casa Rosa.’ Spring and summer-blooming bulbs are crowded into these curb strips as well, because they provide the perfect growing conditions for bulbs, namely wet conditions in spring and bone-dry conditions in the summer. These Oriental lilies only reach about 3 feet tall down here–I have others in amended flower beds elsewhere on the property that are 7 feet tall, so my neglect helps to keep them shorter down here! 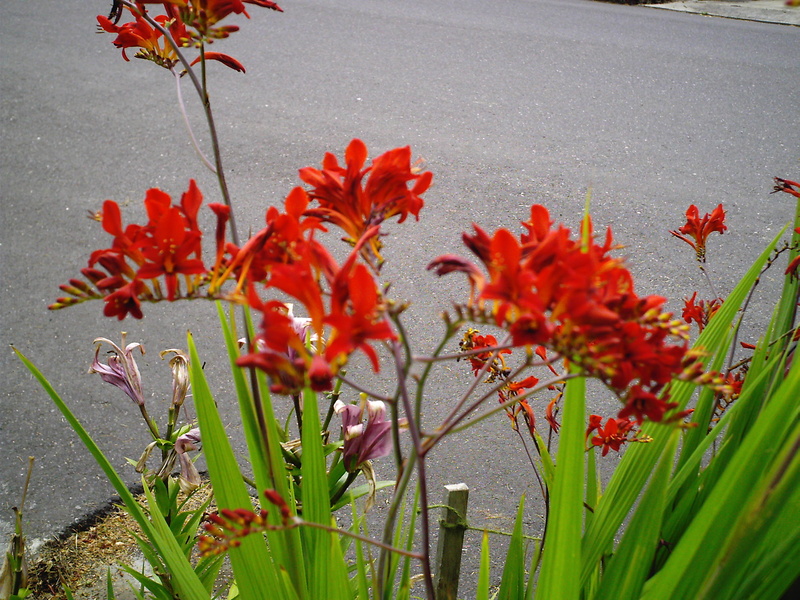 This is growing in a terrace bed opposite the curb strip. The large plant is Santolina ‘Pretty Carroll.” It started life as a one-gallon sized plant, and as you can see it is gigantic now, especially when in bloom. The foliage is such a lovely contrast to the bright yellow flowers–very cool grey and fillagree-looking. 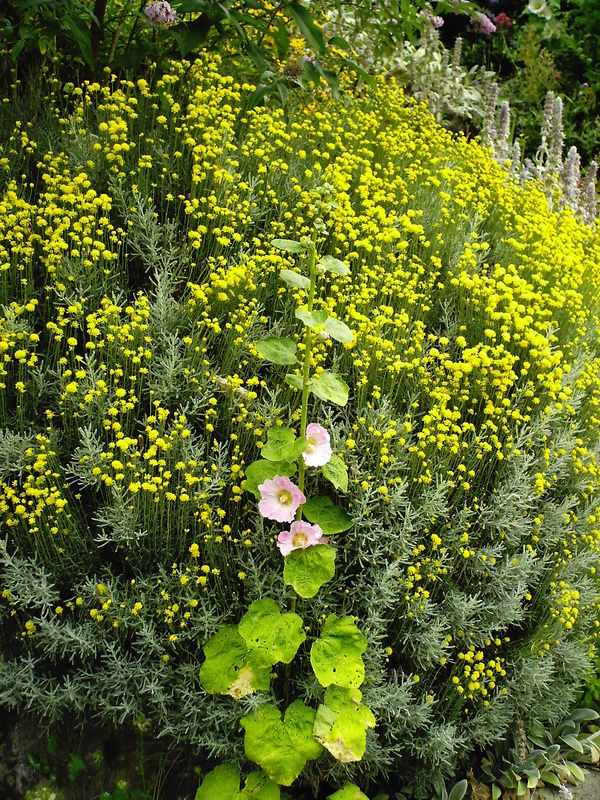 With it sprung up a light pink hollyhock that reseeded there, so I just left it and am happy with the result. Opposite this is the blue catmint, so there is lots of blue contrasting with yellow going on here, of which I am particularly fond. Just barely in the shot at the top is a hint of the large butterfly bush now in flower, called ‘Pink Delight,’ which is a beautiful pink and another hummingbird favorite. Feel free to leave a comment–what types of plants do you like to grow in your curb strips, or other low/almost no maintenance plants have you found to be effective in your landscape? Please stop on by the Tuesday Garden Party as well–lots of fun seeing everyone’s gardens! Update: Many technical difficulties in the original post, so I am trying to post this again. Thanks for your patience! I wanted to share with you an article I wrote for a local small newspaper (no longer in business) when I was their garden writer. 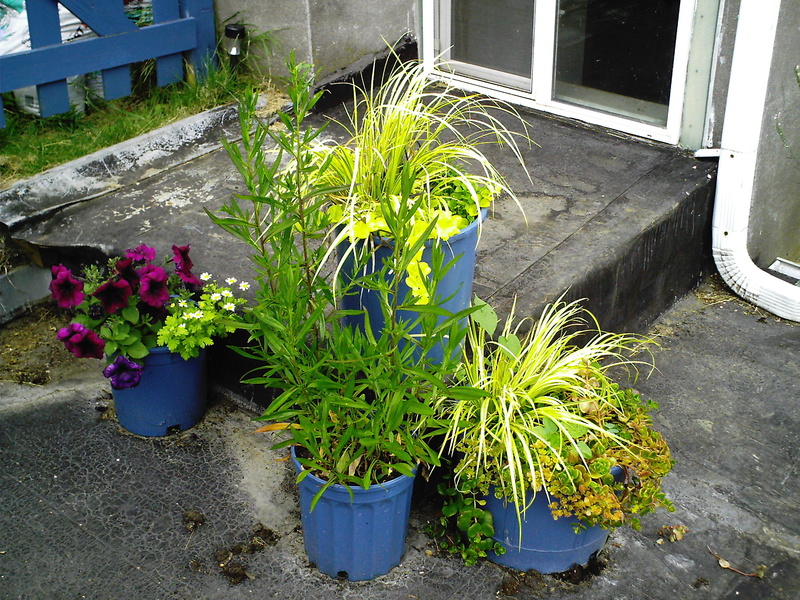 My focus for this column was “Container Gardening,” and I came up with this topic one week. All of the pictures were taken by me of clematis that I grow in my garden. Enjoy! 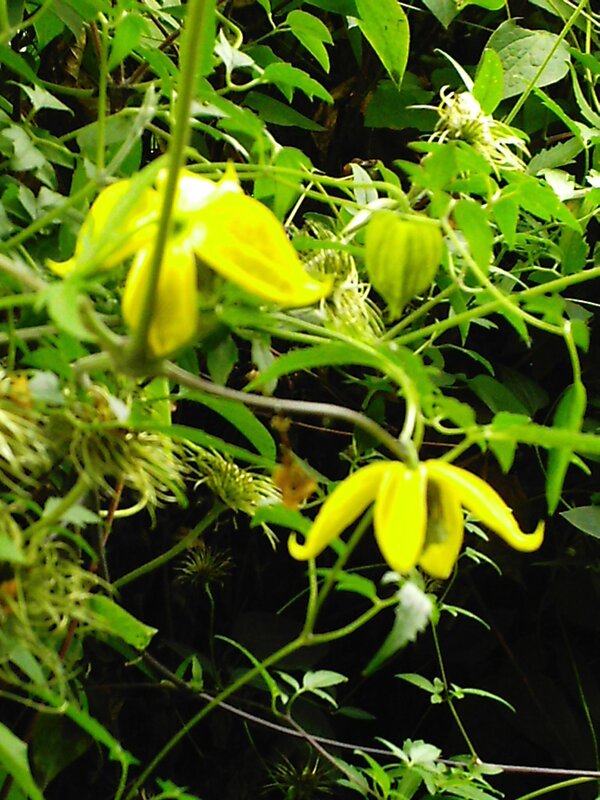 Clematis is a diverse genus of flowering vines. 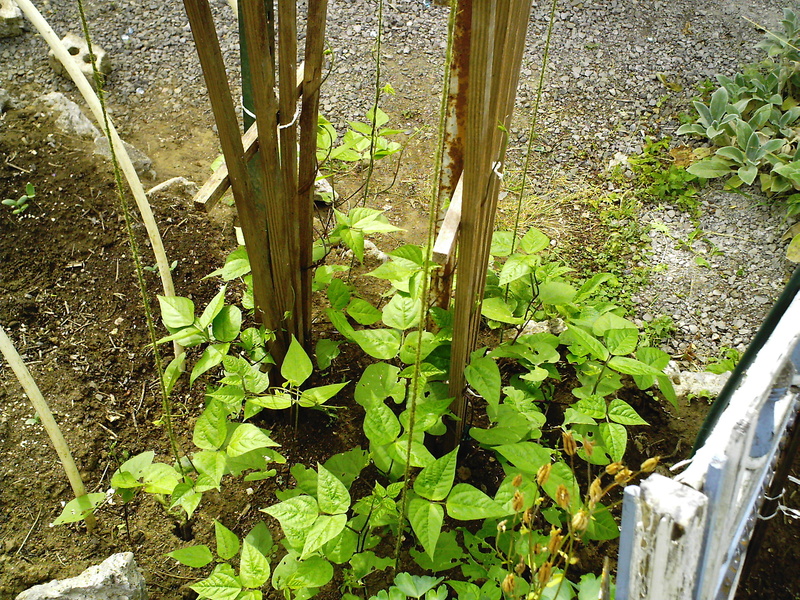 While there are some monsters that will grow twenty to thirty feet of stems in one season, others will remain at a petite eight to ten feet tall and are suited for container gardening. 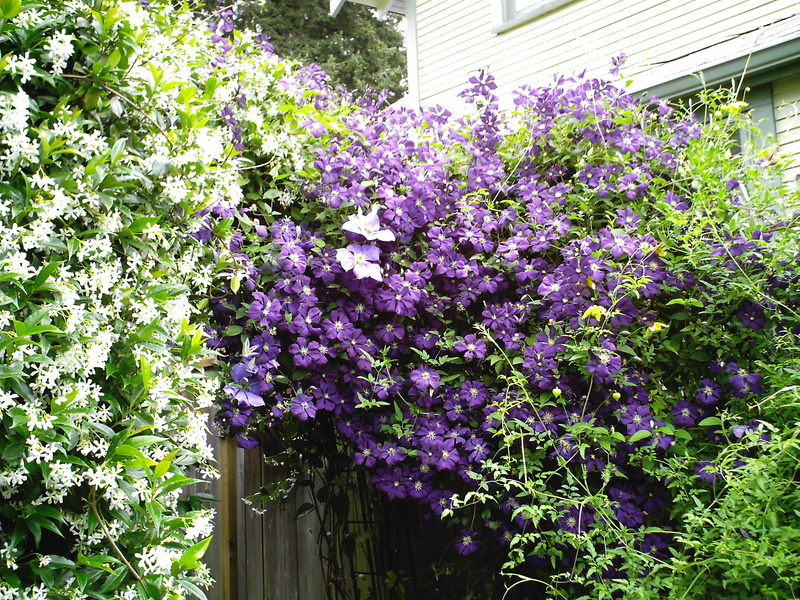 My favorite clematis expert is Portlander Linda Beutler, whose book Gardening with Clematis: Design and Cultivation is filled with terrific tips and tricks especially suited to Northwest gardeners for getting clematis to perform at their best. After reading her book and hearing her speak at gardening workshops at the Camas Public Library and Joy Creek Nursery, I decided to give container-grown clematis a try for myself. To begin this gardening adventure, I started discovering plants that will thrive within the constraints of a container. I’ve had good luck so far with three large-flowered hybrids. The first is “Asao,” which has darkish pink blooms accented with lighter pink centers and which blooms early in the season, from the end of April until the end of May. Linda advises that if you sparingly prune off the dead ends and fertilize it at half strength right after it finishes its first bloom, it will often rebloom for the month of September. This clematis doesn’t need any hard pruning to keep it in full fig, just a light trim to keep it neat. ‘Asao ‘ is quite happy in my garden growning in an eighteen-inch tall and wide turquoise-blue plastic pot along with the October through February-blooming double soft pink Camellia sasanqua ‘Jean May.’ ‘Jean’ stays much smaller than her later blooming, sometimes tree-sized, Camellia japonica cousins. Because this evergreen camellia is more shallow-rooted than the clematis, it is happy to spread its roots near the upper portion of the pot while the clematis burrows its roots deeper down in the pot, thereby cooperating in limited quarters. I also like to add some shallow-rooted annuals, including summer-blooming pastel sweet peas and baby-blue ‘Cambridge Blue’ lobelia with a dark purple, fragrant heliotrope to the mix to create a container that has something of interest going on four seasons of the year. This pot thrives in a covered entryway to the house so that harsh winter rains don’t crush and dissolve the somewhat tender camillia blossoms. Two other of my favorite clematis for containers include the double purple ‘Daniel Deronda,’ and the double pale lavender ‘Louise Rowe.’ Both ‘Daniel’ and ‘Louise’ flourish under the same regime of pruning and fertilizing that I use with ‘Asao,’ and both bloom at about the same time as ‘Asao.,’ ‘Daniel’ is wonderful growing up through something yellow or chartreuse. I placed the container so it grew near a large yellow David Austin English rose ‘Graham Thomas,’ with some airy, five-foot tall Verbena bonariensis rising up on pencil-thick stems as a purple haze. 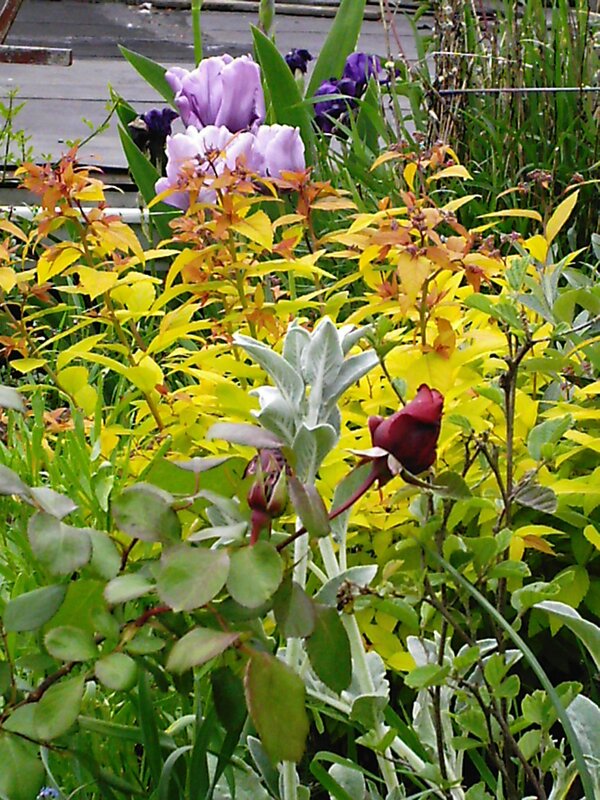 In a container setting, you might select a diminutive chartreuse-foliaged shrub in a neighboring pot, such as the small, two-foot tall and wide evergreen Hebe ‘Co-ed,’ with chartreuse foliage maturing to green, and purple summer flowers. (Update July 2010: I would no longer recommend Hebe shrubs in general, because our recent cold winters have killed every one of mine. A better option for a small evergreen would be a heather or heath, which also blooms in the winter and has lovely and often colored evergreen foliage in other seasons.) Another colorful choice would be the two-to-three feet tall Berberis thunbergii “Aurea Nana,’ with golden foliage, mid-spring yellow blooms and red berries in the fall. ‘Louise’ is a fascinating clematis to watch over the growing season, because it can simultaneously have single, semi-double, and double flowers in bloom. Her flower color is set off by close proximity to the color blue, perhaps used as the color of the container in which she grows, which is what I did, or accomplished by growing other blue-flowered or -foliaged plants close at hand. One that I like is Cerinthe major ‘Purpurascens.’ An annual that reseeds rather freely in my garden, it has blue-green leaves on arcing stems, and at the tips of each stem flowers a small tubular dark purple blossom. It looks great combined with that stalwart and infinitely blendable annual, lacy Dusty Miller. 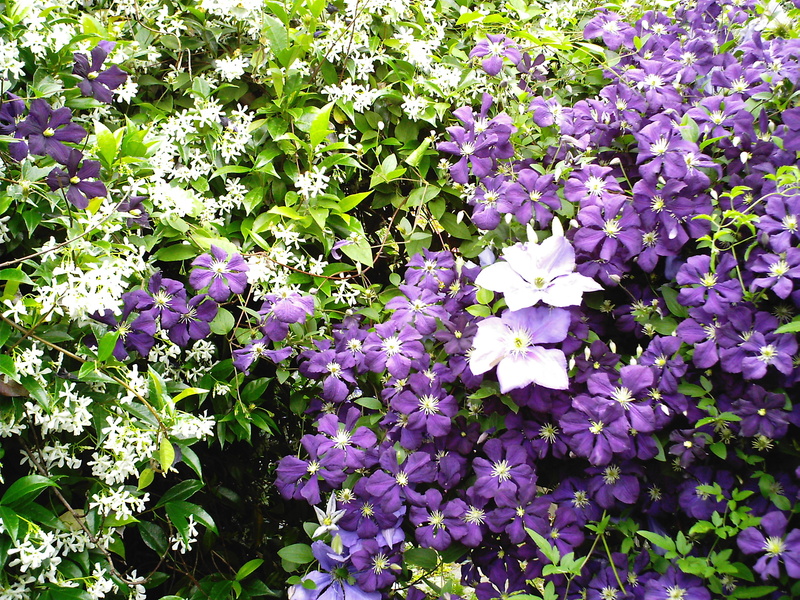 Both annuals keep their good looks from spring through fall, helping not only to intensify the clematis flower color but also to carry the container over while the clematis is in-between first bloom and rebloom. 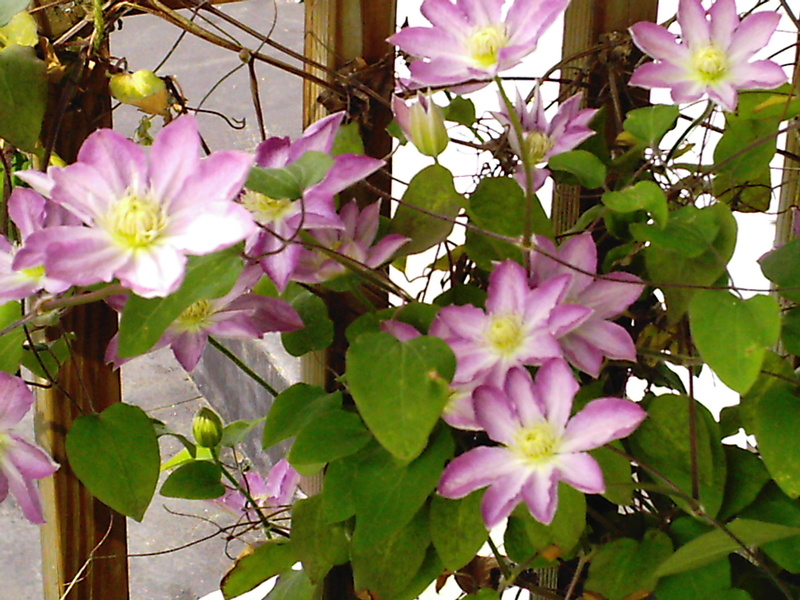 True to their vine nature, pot-grown clematis need some kind of structure upon which to grow. 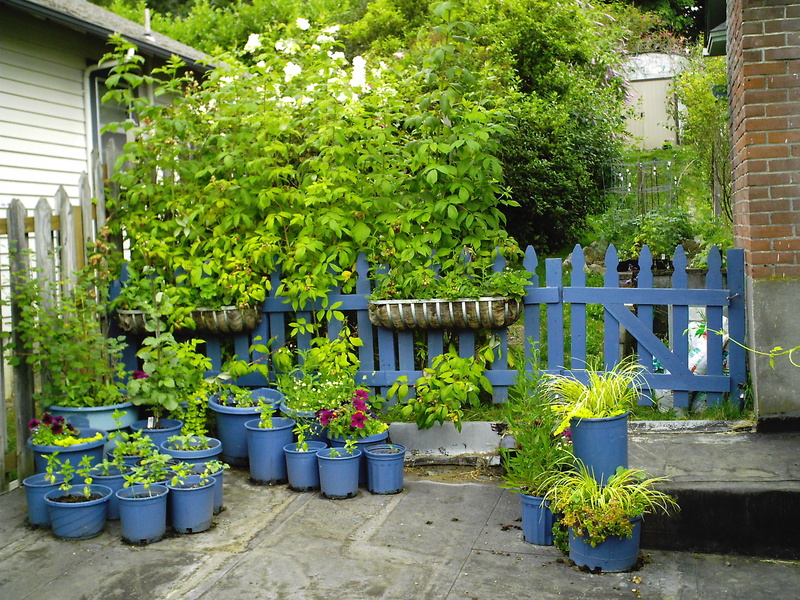 I met this need by placing my containers near structures upon which the plant could grow, such as a large rose and a handrail and spindles. 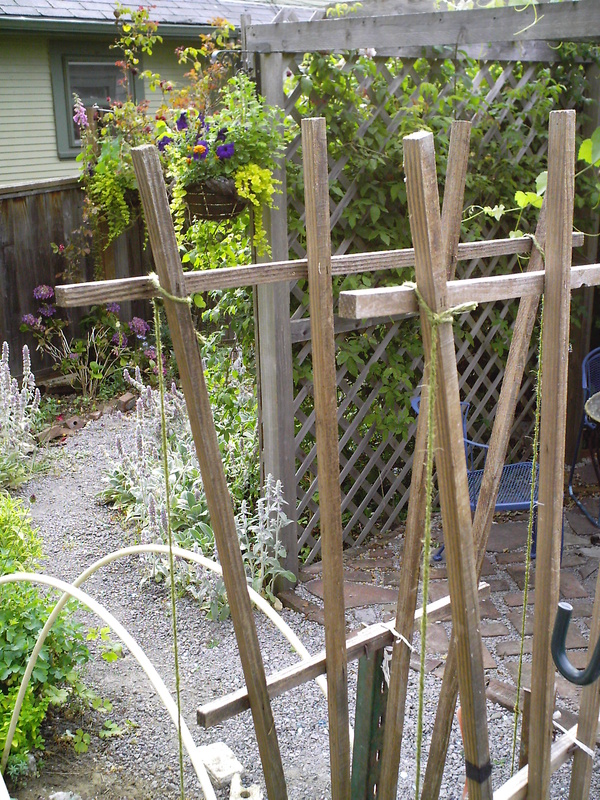 If you wanted a freestanding container, you could use a narrow piece of trellis at least twice the heigth of the pot and eight to ten inches below the soil surface to anchor the structure. 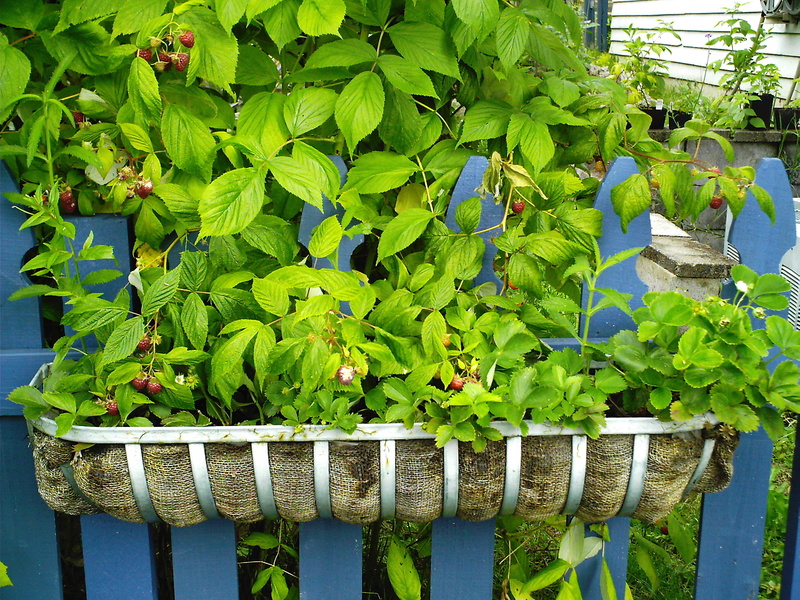 Trellis can be purchased, or homemade out of wood, copper tubing, even painted one-half inch PVC pipe connected with appropriate fittings. 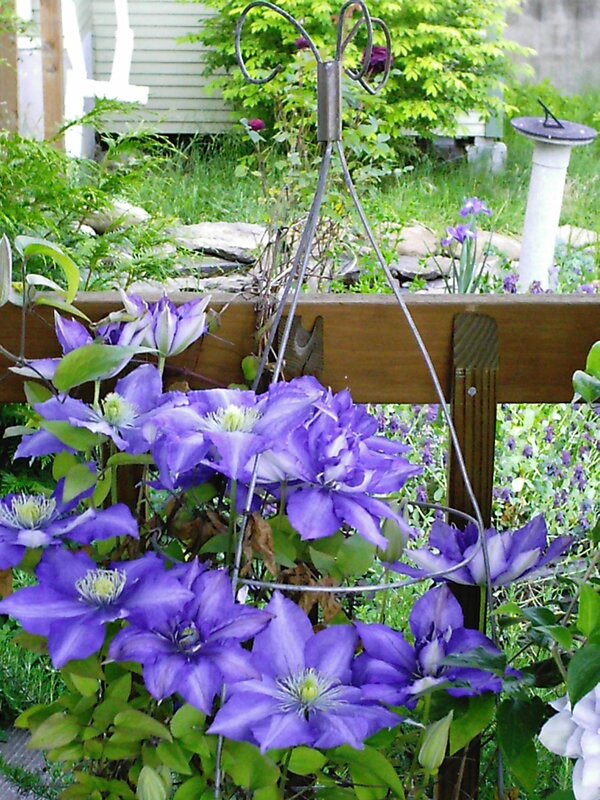 Clematis will need to be tied to any supporting surface diameter greater than one-half inch. 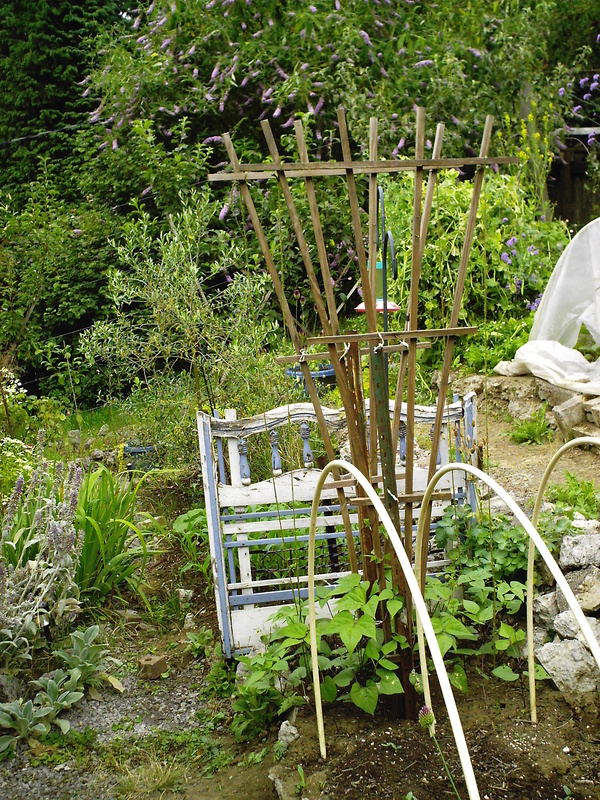 You can wrap larger supporting posts with chicken wire and the clematis should be able to climb up the structure on its own, with just a little help from you in the form of attaching it with twine while the plant is young. 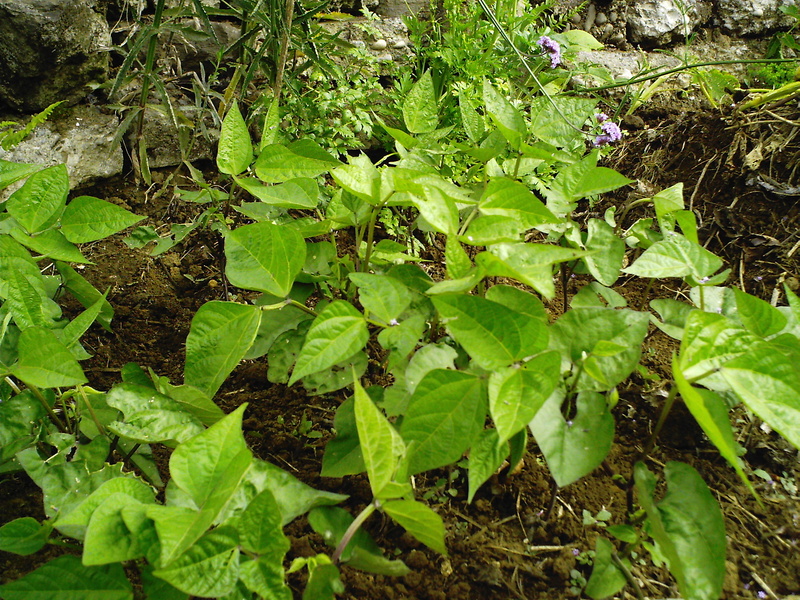 Because these vines will be living in pots for several years, it’s a good idea to choose high-quality potting soil. I succeeded with my three clematis by following many of Linda’s tips on the best type of potting soil and planting method. She recommends looking on the label of the soil to see if it contains something to lighten the soil like sand or pumice, composted manure and worm castings, kelp meal, dolomite lime, bat guano and bone meal. 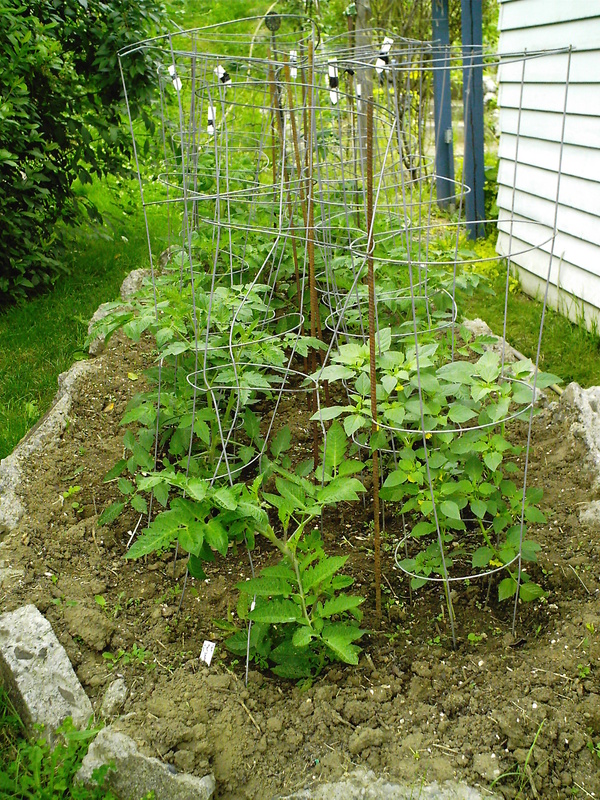 If you make your own homemade compost, add some of that to the mix as well. Before filling your pot with soil, put some fine metal mesh in the very bottom of the pot to cover the drainage holes so the soil doesn’t run out, next a couple of inches of gravel for good drainage, then add soil mixed with a sprinkle of slow-release fertilizer about halfway to the top, after which you can place your new plant into the pot. You want to cover the root ball plus about three inches of the stems. 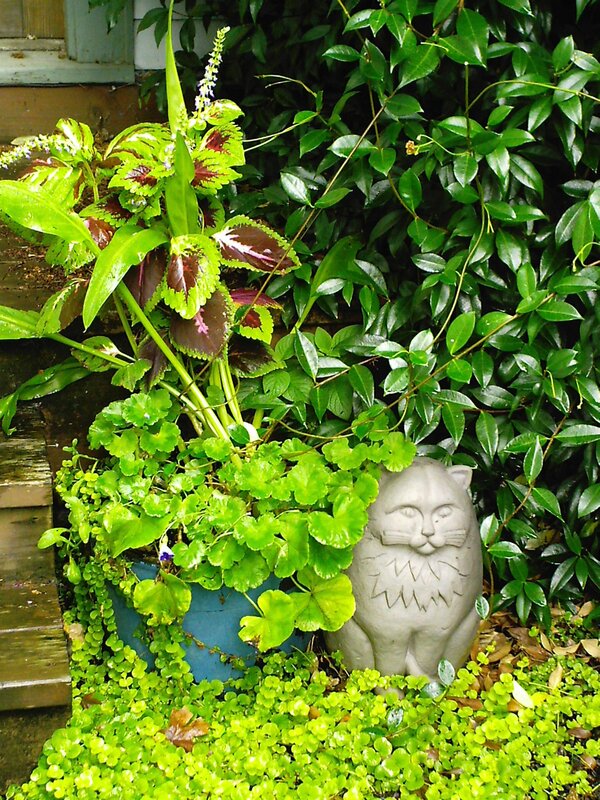 Adjust the soil level so the plant is at the appropriate depth, insert whatever supporting device you chose to use, then fill in the container with more of the potting soil until you’re within a couple of inches of the top of the pot. Water at this point, allow the soil to settle, and add soil as necessary so the soil level remains at a couple of inches below the top of the pot. 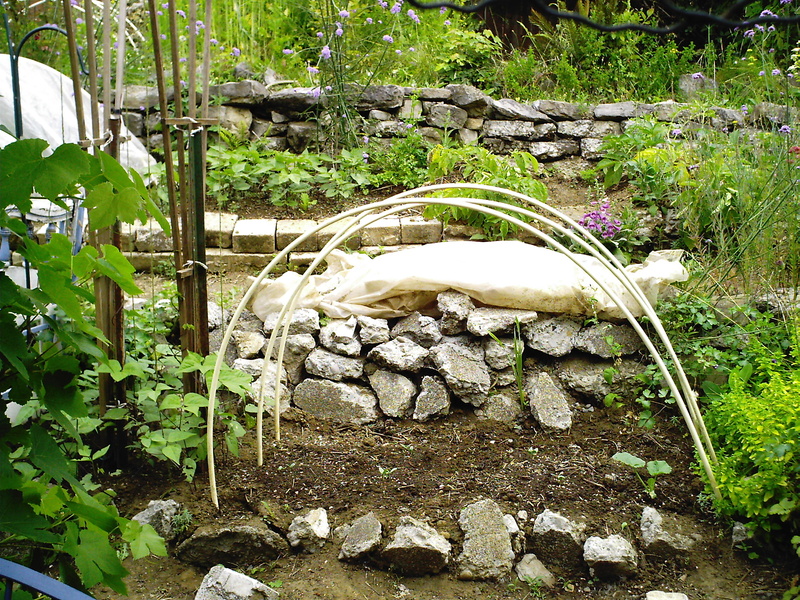 Tie the clematis to the structure, then finish with a thin top layer of gravel for a mulch. 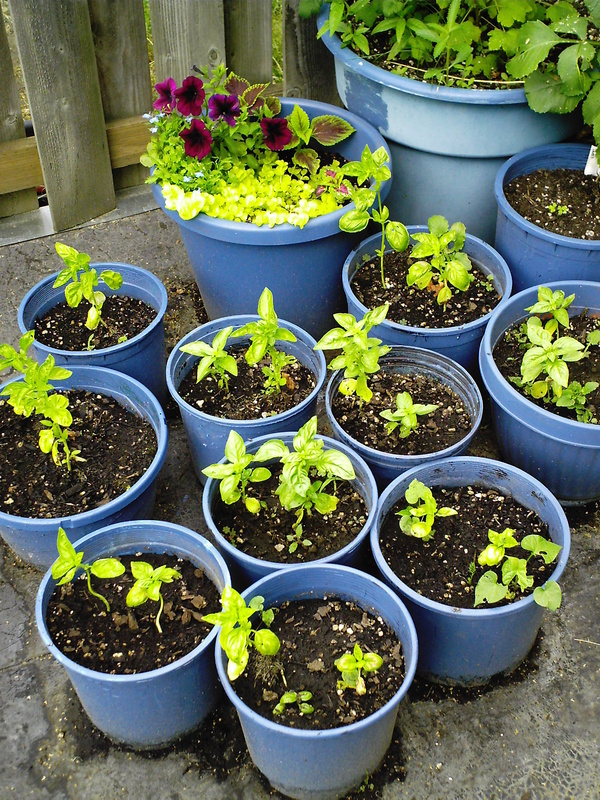 For maintence, it’s best to water every one to three days depending on how dry it is. Linda also recommends that six weeks after you pot up the clematis you should start using flower-boosting fertilizer about once a week until the plant has set bud, then stop fertilizing until after it has finished blooming and you’re preparing it for fall rebloom. 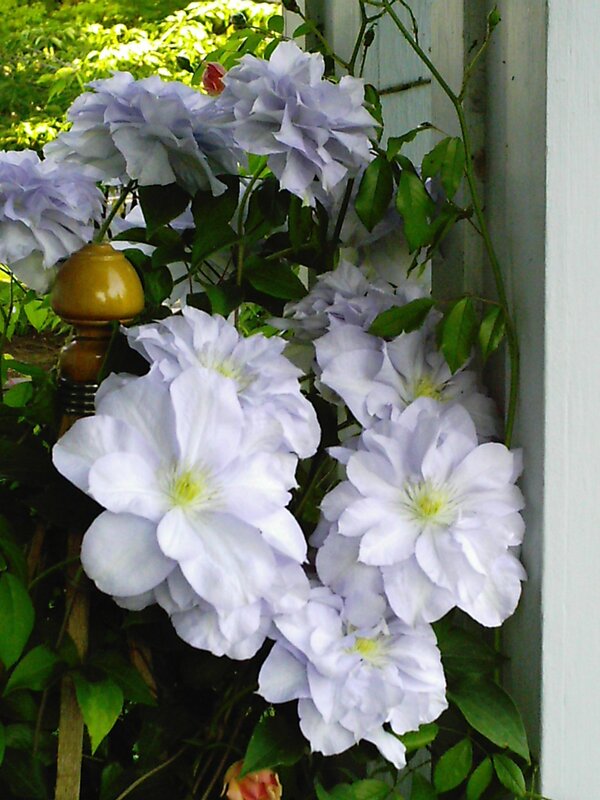 If you’re like me, you will quickly become enamored of these amazing vines, and you will be well on your way to enjoying dapper spring and fall-blooming clematis that may well be the abundant showpiece of your container garden. It’s Tuesday, so please head on over to the Tuesday Garden Party, where you will see lots of beautiful gardens! And enjoy this hot weather! Made Strawberry Freezer Jam and Froze Strawberries On This 4th Of July! Not a traditional way to spend the Fourth, admittedly, but my wonderful husband went to a you-pick farm yesterday and picked 22 pounds of lovely strawberries. Since we had company over yesterday and I was busy cooking for that, he also washed and hulled all the berries for me–what a sweetie! Into the refrigerator they went until today, when I turned them into jam and frozen whole berries. I just do individually quick frozen berries–place the cleaned berries on a cookie sheet so the berries are not touching one another, and then place the sheet in the freezer. In an hour or two, they are frozen and can be transferred to a labeled ziplock bag, which is what I did. I also made sugar-free jam. I have a neat cookbook called Canning and Preserving Without Sugar by Norma M. MacRae, who is a dietician and nutritionist. The recipe I used is called “Strawberry Preserves.” I like my jam fruity and fairly soft set, so I don’t really like to use pectin at all. The recipe calls for 10 cups cleaned strawberries, 2 tablespoons fresh lemon juice (I also added some rind as well), concentrated white grape juice (you take 3 cups of white grape juice, put in a pot and boil it down to 1 cup. ) That’s it. Take 5 cups of the strawberries and put them in a big nonaluminum pot (I use an 8-quart stainless steel stock pot) with the lemon juice and grape juice. Bring it to a full rolling boil, stirring constantly, then reduce the heat a bit and continue cooking until it thickens a bit. It was about 15-20 minutes for me. (It does set up more as it cools.) Take the pot off the heat, and stir in the remaining 5 cups of strawberries, which you can dice, slice or leave whole–your preference. This cools the mixture off quite a bit. I then decided to freeze it, so I filled my plastic containers, leaving 3/4 of an inch at the top (this is important, because the jam will swell when frozen.) Put the lid on, and label it. I also made up 3 pints which I put in the refrigerator to eat up in the next couple of weeks. One batch makes 10 1/2 cups of jam, or roughly 5 pints. Total, I made 14 pints of sugar-free jam, and ended up with 1 one-gallon bag full of individually quick frozen whole strawberries. We paid $1/pound for the berries (! ), and about $2.90 for the white grape juice. I already had some fresh lemons and containers, so this ended up being a fairly inexpensive project that I will be very happy to have come cold winter weather. Deadhead and fertilize the roses: This is an ongoing project throughout the summer months. It is easy to do, and it helps to keep your rose bushes flowering throughout the bloom season. You will need garden pruners and a bucket. It is easy to get scratched while doing this, so wear long sleeves and garden gloves to protect your skin, and always wear eye protection when pruning shrubs–little pieces can easily break off and you do not want them in your eyes–trust me, I know from experience. Or you can get a ‘Zephrin Drouhin’ thornless climbing rose–it is a beauty with deep pink blooms. Simply look at the plant, and anywhere there is a dead rose blossom, cut it off. I like to take my cut down to the nearest 5-leafed stem, and cut just above the five-leafed stem. This way the growth hormones of the rose will produce another bloom there. You can also cut off any dead, broken, or diseased stems off. Place all this in your bucket and do not put in the compost pile if there are diseased plant parts present, but put in the trash can instead. I will also be fertilizing all my roses. I do this once a month during bloom time, and I use Miracle Grow, but you could use any good rose fertilizer as well. Deadhead the clematis as needed and fertilize them: I fertilize them, along with the roses, once a month with Miracle Grow, but they respond well to rose fertilizer as well. 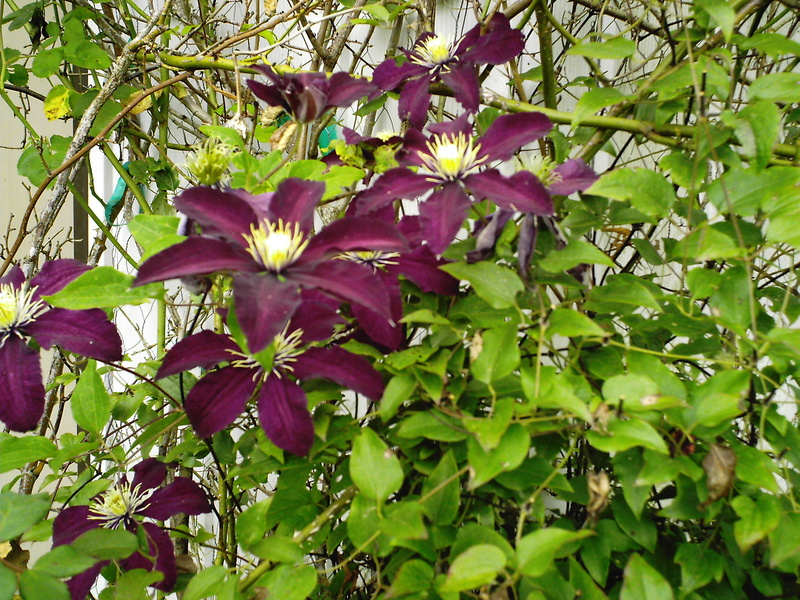 Some clematis will rebloom if deadheaded. I do this with my burgundy ‘Niobe’ and purple ‘Daniel Deronda’ clematis. My late spring-blooming clematis are still blooming because spring was delayed here due to cold weather, but after they are done, they can be pruned back and fertilized for rebloom in the fall. It could be tricky this year because they were late in blooming, so it might make rebloom in fall come too late with colder weather. Would have to play it by ear on this idea this year. 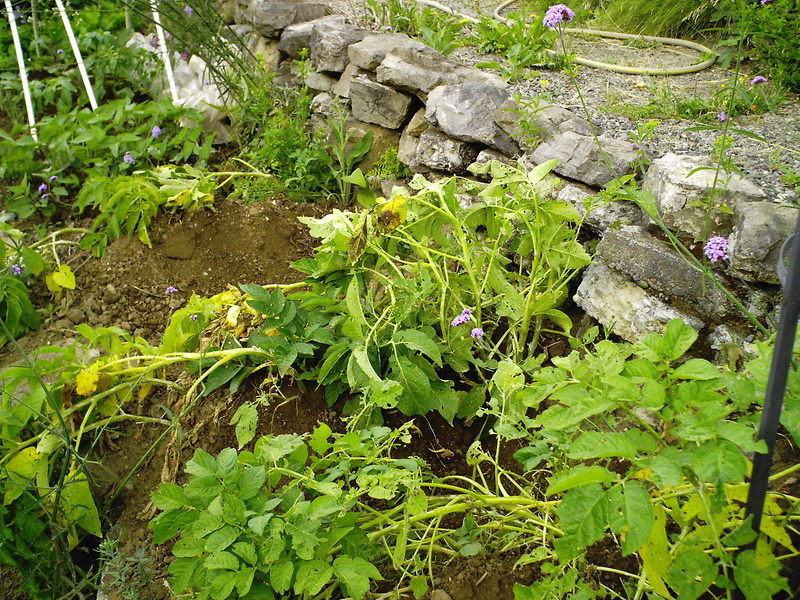 Stake and weed beds; remove fading bulb foliage: It seems like staking and weeding is a neverending process during the growing season. 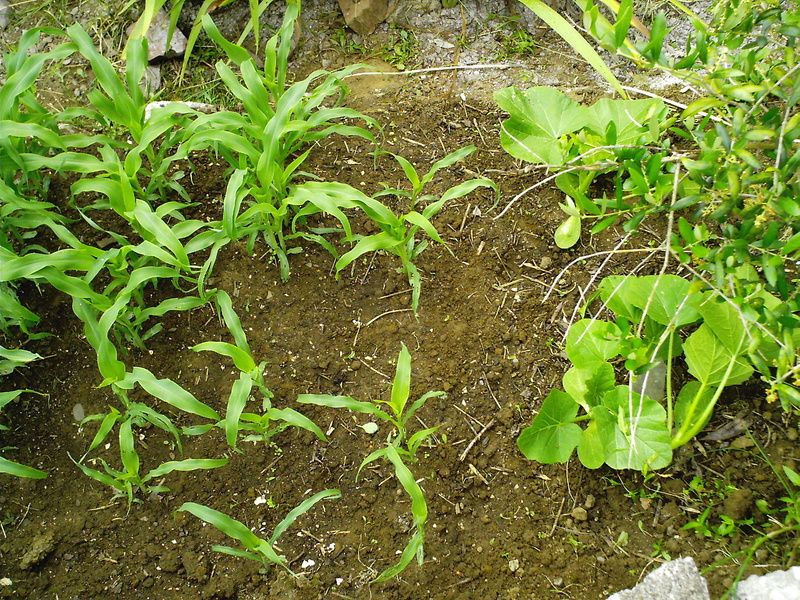 Bulb foliage that is yellowed can be removed from the beds. It is also time to add some compost to where your bulbs grow. 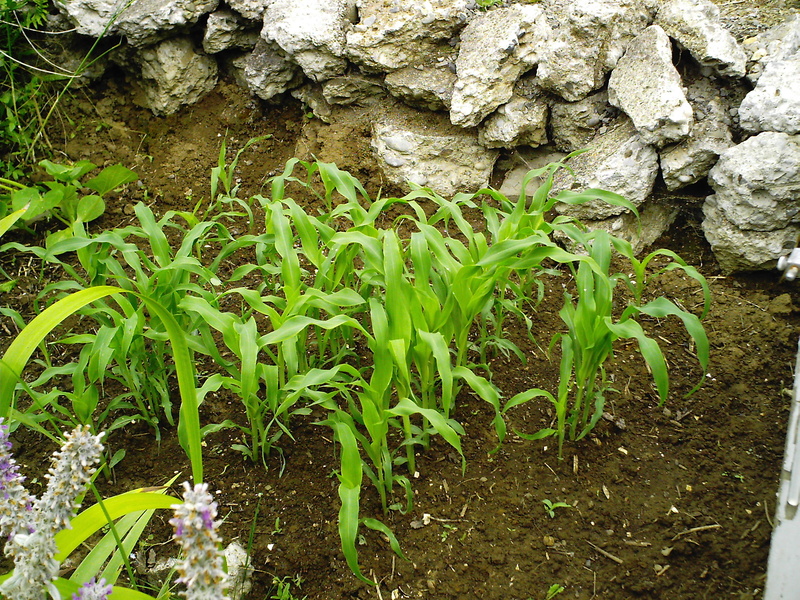 This will help to improve the tilth of the soil, and depending on the potency of your compost, may give a bit of a light feeding. Those bulbs will be beginning to store up food for next spring’s blooms, so you can help them do so by giving them a bit of compost now. Plant a basket container: I ended up with a cylindrical dark brown basket that I no longer use indoors, but I thought if I lined it with a plastic bag, it would make an interesting container for plants. I still have burgundy and green coleus starts that I grew from seed, and I have quite a few ferns that tend to appear on their own without any help from me in various spots on our property, so they will go into the basket. Clean and fill bird feeders: I have a roofed tray feeder that many types of birds really like, because they can see into it and fly through it. In this I put black-oil sunflower seed in the shell, which many birds like. I found that if I use the cheaper kinds that are full of millet, they push all the millet out of the feeder in their search for the apparently tastier sunflower seeds, and millet makes a mess under the feeder because it grows into a matting grass that I don’t like. The hummingbird feeder will also be cleaned and refilled today as well. I have a great feeder that is made of glass and plastic, and it has a wide mouth so I can put a soapy sponge all the way down to the bottom to get it really clean. I also try to cleanse it by placing 1 capful of bleach into a sinkful of water, and letting the bird feeder soak in that for a minute or two. You could also use hydrogen peroxide in the same amount if you don’t like bleach. Then I rinse it well and fill it with nectar that I make using four parts sugar and one part water in a pot on the stove, which I let gently boil for only 5 minutes with the lid on, then remove from heat. After it cools a bit, I strain it using a paper coffee filter in a funnel, and store it in a closed jar in the refrigerator. No food coloring is needed. I clean my feeder 2-3 times per week, but you could do it more, especially if the weather gets really hot. I had planned to chop the bigger, bulkier stuff that has not broken down in my compost pile, but that plan is averted due to rain. It clogs up my little chopper something fierce to try to run wet matter through it. Will wait till it is all dried out again. I always get motivation to make the garden look nice when I have company coming over, and in fact we’re having guests over tomorrow night for dinner, and hopefully the weather will cooperate so we can eat outside under the pergola! I’ve been so busy getting the vegetable garden in that the flowers tend to take second place at this time of year, but I will try to whip things into shape a bit. Also I like entertaining outside because I don’t have to clean the whole house prior to guests arriving, just the rooms they will likely see, like the bathroom and kitchen, so it’s a little easier to accomplish. My husband accuses me of being Martha Stewart’s sister when it comes to perfectionism in entertaining, and I am trying to curb my unhealthy ways by throwing more small and impromptu dinners that I don’t have to stress over, which is more fun for me as well, and so the outdoor pergola helps in this regard as well. My office is right near the pergola, so I want to try to come up with some fun youtube music playlists and then I can open the window and put my speaker into it, so we can have some nice music playing while we eat–we’ll see how far I get on that project. Weather reports for next week show that it is supposed to go up into the 90s–I will believe it when I see it, but a girl can dream, right? Please leave a comment–do you have some great tips for easy outdoor entertaining? I’d love to learn!